Please read these Terms of Service (“Terms”, “Terms of Service”) carefully before using the www.theromancecode.com website (the “Service”) operated by The Romance Code (“us”, “we”, or “our”). Subject to your compliance with the Terms, we grant to you a revocable, personal, non-exclusive, non-assignable and non-transferable license to (i) access and use the Services, and (ii) use the The Romance Code Content (defined below) solely as permitted under these Terms (the “Limited License”). We may suspend or terminate the Limited License in our sole discretion at any time. Without limiting the generality of the foregoing, we may suspend or terminate the Limited License if you: (i) breach any obligation in these Terms or in any other agreement between you and us or (ii) violate any policy or guideline applicable to the Services. Any users who have previously had their Services accounts suspended or terminated by us are prohibited from creating more Services accounts without explicit written consent from us. We may, in our sole discretion, refuse, terminate, or limit access to the Services to any person or entity. While we are not obligated to monitor your use of the Service or to review, screen, or delete your User Content, we have the right to do so in our sole discretion. By way of example and not limitation, we reserve the right to remove all or a portion of any User Content to comply with applicable laws or the order or requirement of a court, administrative agency, or other governmental body. We reserve the right, at any time and without prior notice, to remove or disable access to any User Content in our sole discretion. You understand that, by using the Services, you may be exposed to User Content that might be offensive, harmful, inaccurate, or otherwise inappropriate. We may modify or adapt your User Content in order to transmit or display it over computer networks and in various devices, due to requirements or limitations of any networks, devices, services, or media. We may allow you to link various social networking, email, or other online accounts to your Services account. You may only link your own accounts. We will access and retrieve your account information from these sites on your behalf, to make certain information or services available to you through the Services. By linking your other accounts, you authorize us to access your information from those third party accounts, on your behalf as your agent, and permit us to access, use, and, in some cases, store that account information. The Website and its entire contents, features and functionality (including but not limited to all information, text, displays, images, video and audio, and the design, selection and arrangement thereof), are owned by the Company, its licensors or other providers of such material and are protected by United States and international copyright, trademark, patent, trade secret and other intellectual property or proprietary rights laws. Except in furtherance of requesting or performing a Project, you must not access or use for any commercial purposes any part of the Website or any services or materials available through the Website. To engage in any other conduct that restricts or inhibits anyone's use or enjoyment of the Website or which, as determined by us, may harm the Company or users of the Website or expose them to liability. Our Service may contain links to third-party web sites or services that are not owned or controlled by The Romance Code. The Romance Code has no control over, and assumes no responsibility for, the content, privacy policies, or practices of any third party web sites or services. You further acknowledge and agree that The Romance Code shall not be responsible or liable, directly or indirectly, for any damage or loss caused or alleged to be caused by or in connection with use of or reliance on any such content, goods or services available on or through any such websites or services. After creating a Services account, you are solely responsible for any activity that occurs from your account. You are solely responsible for maintaining the confidentiality of your password, and you agree that you will not share your password with others or do anything that might jeopardize the security of your account. Take appropriate legal action, including, without limitation, referral to law enforcement, for any illegal or unauthorized use of the Website. Terminate or suspend your access to all or part of the Website, as set forth below. However, we cannot and do not undertake to review all material before it is posted, and cannot ensure prompt removal of objectionable material after it has been posted. Accordingly, we assume no liability for any action or inaction regarding transmissions, communications or content provided by any user or third party. We have no liability or responsibility to anyone for performance or non-performance of the activities described in this section. You agree that we shall not be liable for any termination of your access to the Website. All sections which by their nature should survive the expiration or termination of this Agreement shall continue in full force and effect subsequent to and notwithstanding the expiration or termination of this Agreement. We reserve the right to temporarily or permanently modify or discontinue any portion of the Services without prior notice. You agree that we will not be liable for any modification, suspension, or discontinuation of the Services or any part thereof. We also retain the right to create limits on the use of and storage capacity of the Services at our sole discretion, at any time, without prior notice. The Services are available “AS-IS”. THE SERVICES AND The Romance Code CONTENT ARE PROVIDED ON AN “AS IS” AND “AS AVAILABLE” BASIS, WITHOUT WARRANTIES OF ANY KIND, EITHER EXPRESS OR IMPLIED, INCLUDING, WITHOUT LIMITATION, IMPLIED WARRANTIES OF MERCHANTABILITY, FITNESS FOR A PARTICULAR PURPOSE OR NON-INFRINGEMENT. The Romance Code MAKES NO WARRANTY THAT THE SERVICES WILL ALWAYS BE SECURE, FREE OF ERRORS, OR WILL MEET THE USER’S REQUIREMENTS OF FEATURES, AVAILABILITY, DELAYS, OR DISRUPTIONS. Indemnity. You agree to indemnify and hold The Romance Code, our officers, directors, shareholders, employees, agents, and affiliates (the “The Romance Code Parties”) from and against any and all costs, damages, liabilities, and expenses (including attorneys’ fees) due to, arising out of, or relating in any way to your use of the Services, the use of the Services by any person using your account, your violation of these Terms, or your violation of the rights of another. Limitation of Liability. Except where prohibited by law, in no event shall The Romance Code or the The Romance Code Parties be liable for any indirect, special, punitive, incidental, exemplary or consequential damages that result from (a) the use of, or inability to use, the Services; (b) the provision of the Services, or any materials available therein; or (c) the conduct of other users of the Services, even if The Romance Code has been advised of the possibility of such damages. You assume total responsibility for your use of the Services. Your only remedy against The Romance Code WITH RESPECT TO THE SERVICES or any content is to stop using the Services. Arbitration. PLEASE READ THE FOLLOWING PARAGRAPH CAREFULLY BECAUSE IT REQUIRES YOU TO ARBITRATE DISPUTES WITH The Romance Code AND LIMITS THE MANNER IN WHICH YOU CAN SEEK RELIEF FROM US. You and The Romance Code agree to arbitrate any dispute arising from these Terms or your use of the Services, except that you and The Romance Code is not required to arbitrate any dispute in which either party seeks equitable and other relief to the alleged unlawful use of copyrights, trademarks, trade names, logos, trade secrets, or patents. ARBITRATION PREVENTS YOU FROM SUING IN COURT OR FROM HAVING A JURY TRIAL. You and The Romance Code agrees (a) that any arbitration will occur in Colorado (b) that arbitration will be conducted confidentially by a single arbitrator in accordance with the rules of JAMS; and (c) that the state or federal courts of Colorado have exclusive jurisdiction over any appeals of an arbitration award and over any suit, if any, between the parties not subject to arbitration. Other than class procedures and remedies discussed below, the arbitrator has the authority to grant any remedy that would otherwise be available in court. WHETHER THE DISPUTE IS HEARD IN ARBITRATION OR IN COURT, YOU AND The Romance Code WILL NOT COMMENCE AGAINST THE OTHER A CLASS ACTION, CLASS ARBITRATION, OR REPRESENTATIVE ACTION OR PROCEEDING. Disputes with Other Users. You are solely responsible for your interactions with other theromancecode.com users. We reserve the right, but have no obligation, to monitor disputes between you and other users, regardless of whether theromancecode.com collected any money on behalf of a Host or provider of Third-Party Services. Forum and Venue. A lawsuit, if any, by you or The Romance Code against the other will occur in state or federal court in Colorado, United States. You and The Romance Code agrees that the jurisdiction and venue of these courts are exclusive. Applicable Law. Any dispute between you and The Romance Code will be governed by these Terms and the laws of the State of Colorado and applicable United States law, without giving effect to any conflict of laws principles that may provide for the application of the law of another jurisdiction. Waiver and Severability. The failure of The Romance Code to enforce any right or provision of these terms will not be deemed a waiver of such right or provision. If any provision of these Terms shall be deemed unlawful, void, or for any reason unenforceable, then that provision shall be deemed severable from these Terms and shall not affect the validity and enforceability of any remaining provisions. Complete Agreement. These Terms supersede all prior understandings regarding the same and represent the complete agreement between you and The Romance Code, however, if you are a Driver and have agreed to a separate agreement with The Romance Code (via a click-wrap consent or written agreement), such separate agreement shall be incorporated herein by reference, and to the extent such separate agreement conflicts with this agreement the separate agreement shall apply. Assignment. These Terms, and any rights and licenses granted hereunder, may not be transferred or assigned by you, but may be assigned by us without restriction. The information presented on or through the Website is made available solely for general information purposes. We do not warrant the accuracy, completeness or usefulness of this information. Any reliance you place on such information is strictly at your own risk. We disclaim all liability and responsibility arising from any reliance placed on such materials by you or any other visitor to the Website and/or Application by anyone who may be informed of any of its contents. This Website may include content provided by third parties, including materials provided by other users, bloggers and third-party licensors, syndicates, aggregators and/or reporting services. All statements and/or opinions expressed in these materials, and all articles and responses to questions and other content, other than the content provided by the Company, are solely the opinions and the responsibility of the person or entity providing those materials. These materials do not necessarily reflect the opinion of the Company. We are not responsible, or liable for, the content or accuracy of any materials provided by any third parties.  The Romance Code‘s agent for notification of claimed copyright infringement can be contacted here. If you have questions regarding the Agreement or the practices of Prosper, please contact us at our website.